Our content on Ecommerce focuses on techniques to increase conversion, Average order value, sales and profitability of transactional Ecommerce sites including retail, travel and financial services. 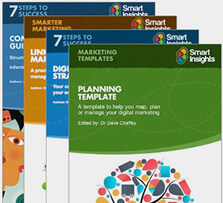 Many of our Expert member resources on Smart Insights advise on how to increase sales on Ecommerce sites. This is a selection of our recommended guides and some of the most useful posts. Successful Ecommerce sites are no different from other online businesses since they have a well defined digital marketing strategy and online brand-strategy. But retailers also have specific techniques to manage which we cover in this section including merchandising, payment and security and sales optimisation. Other digital marketing tactics like Paid search, SEO, Social media, Email marketing and conversion rate optimisation all require different approaches for Ecommerce sites. There is a broader view of Ecommerce which includes non-financial transactions also like B2B lead-generation and email marketing which we cover in other parts of the site.